In 1860 Alpheus P. Sharp established a retail pharmacy at the southwest corner of Howard and Pratt Streets in Baltimore. He teamed with Louis Dohme and later his brother Charles Dohme and they gradually developed a list of pharmaceuticals for which they experienced more than a local demand. 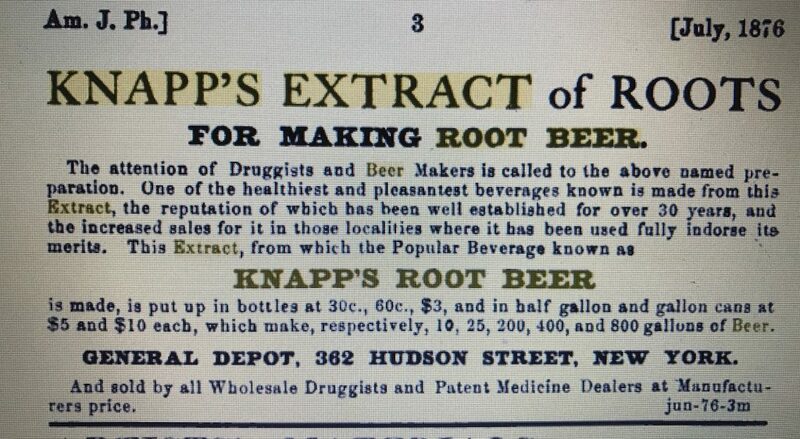 Their proucts included medicinal fluids, solid and powdered extracts, gelatin and sugar coated pills, effervescent salts, hypodermic and compressed tablets, elixers, cordials, syrups and pepsins. 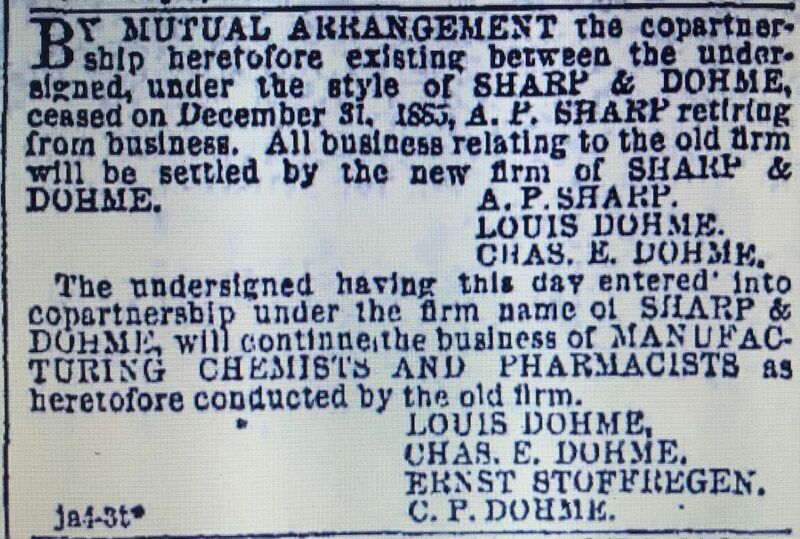 On December 31, 1885, Sharp retired, and Louis and Charles Dome, along with Ernst Stoffregen continued the business. The notice announcing this change was printed in the January, 6, 1886 edition of the Baltimore Sun. The business subsequently incorporated in 1892. In 1889 they established a branch in NYC. According to the NYC Directories, their first location was 16 Cedar Street. In 1891 they were located at 112 William Street and in 1892 they relocated to 41 John Street where they remained through at least 1919. Today, none of these addresses appear to date back to the business. 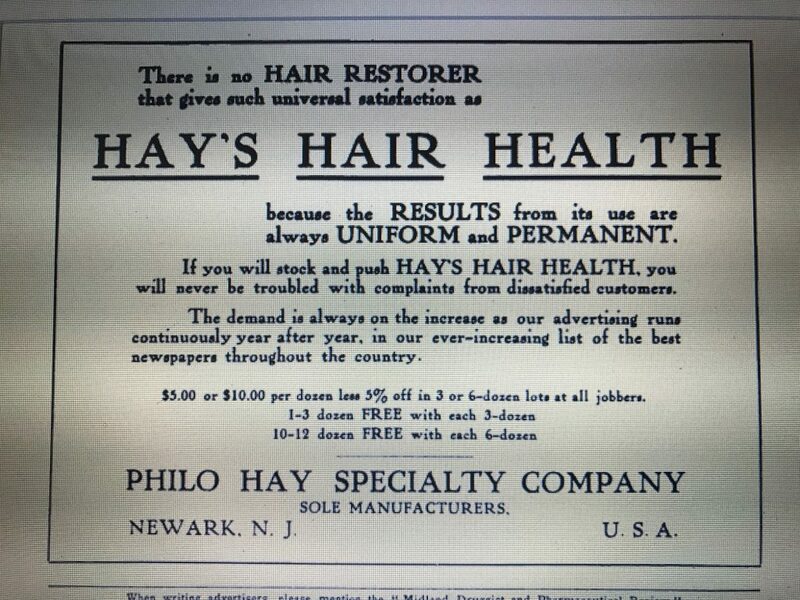 According to a December 31, 1896 article in the Phamaceutical Era, in 1893 Sharp and Dohme transferred it’s general offices including, the advertising, bookkeeping and billing departments from Baltimore to New York. The New York location was under the direction of Ernst Stroffregen and it fed the company’s growth in the eastern and middle states that naturally looked to New York for supplies. The west and northwest was served from a Chicago location. Laboratories were located in Baltimore and that location included the bottling and wrapping department. 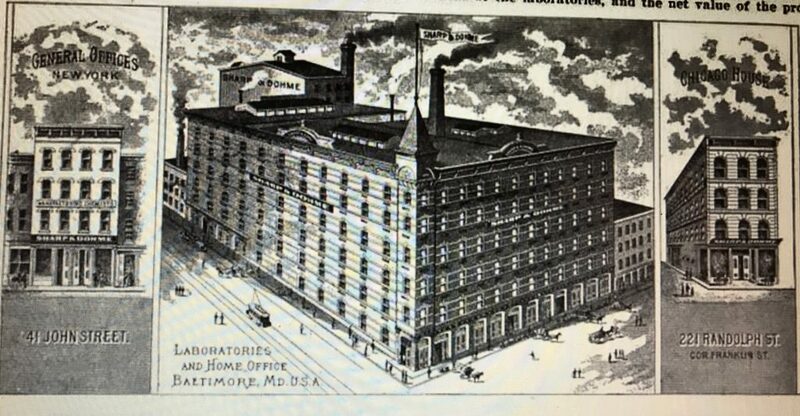 In 1896 the Baltimore facility included two buildings; one six stories the other seven stories. Their list of hypodermics is the largest and most complete made in the country. Their hypodermics are remarkably soluble even in cold water and this feature, which is an unvarying one, together with the quality of drug and accuracy of manufacture easily wins the confidence of the doctor. Sharp & Dohme merged with H K Mulford & Co in 1929. 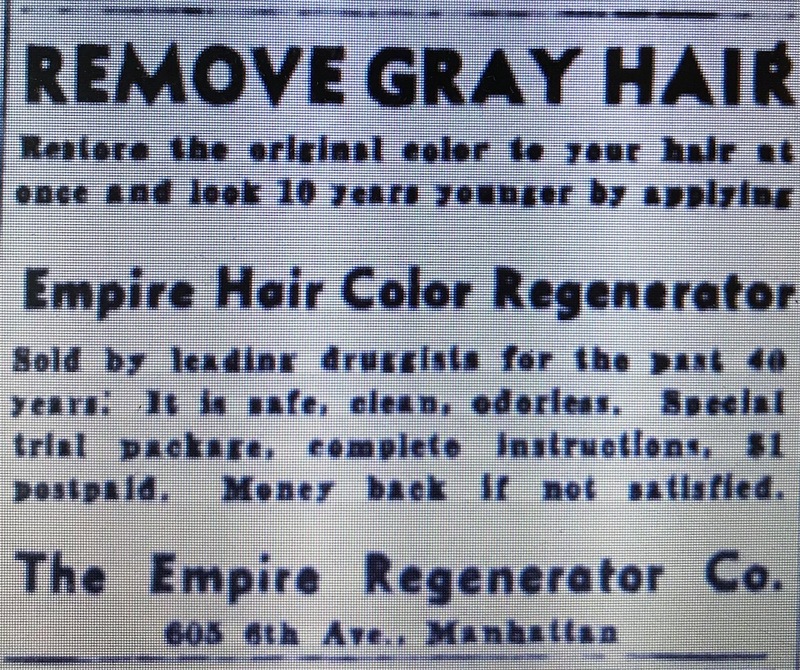 The announcement was printed in the August 9, 1929 edition of the Brooklyn Daily Eagle. The H.K. Mulford Company has the leading biological laboratories in this country and is one of the oldest and best-known organizations in this line of business. Sharp & Dohme is one of the oldest and largest pharmaceutical houses in the country having been founded 69 years ago, manufacturing standard pharmaceutical products and certain controlled medicinal specialties. The deal, one of the most important mergers in the medical industry at the time, closed two months later. At that time, Sharp & Dohme’s New York operation was listed at 78 Varick Street. H.K. Mulford had offices at 119-121 Varick Street. 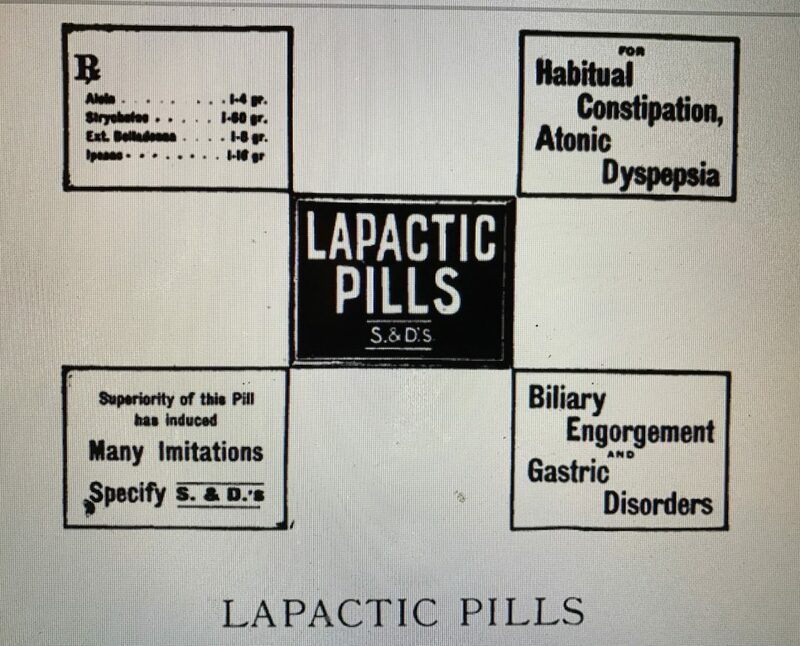 In 1953 Sharp & Dome merged with Merck & Co.
Lapactic Pills are prescribed in all parts of the civilized world for chronic constipation and atomic dyspepsia. A soluble aloin is made by Sharp & Dohme for use in this pill. C T Hurlburt stands for Charles T Hurlburt. The company, established in 1852 was primarily engaged in the preparation of homoeopathic remedies. The company was also known as the American Homoeopathic Pharmacy. 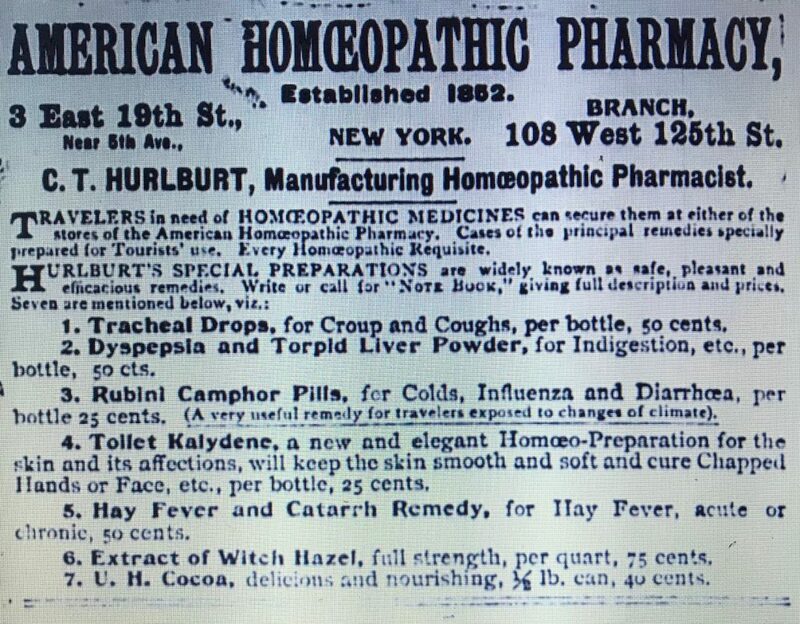 We notice that the old established house of C T Hurlburt, the American Homoeopathic Pharmacy, which has been under his sole management since 1852 has been changed to a partnership under the firm name of C T Hurlburt & Co. The firm consists of Mr C T Hurlburt and his son, Mr Chas F Hurlburt, who has a long experience in homoeopathic pharmacy under his father’s direction and who is now associated with him as a partner. The business was active until approximately 1915 occupying several locations over it’s life span. 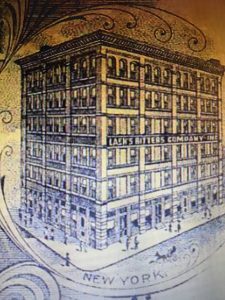 The original location was 437 Broome Street and later, in 1868, the business moved to 898 Broadway between 18th and 19th Street. 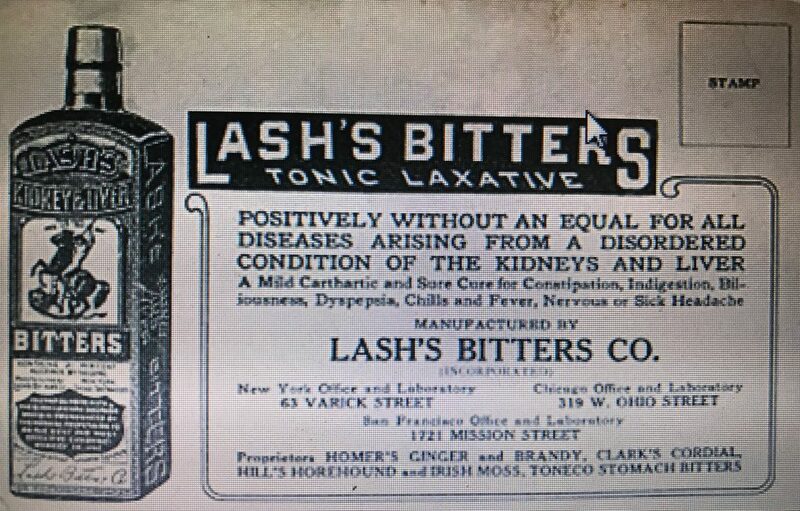 Advertisements during this period mentioned medicines, vials, cases, books and toilet and fancy goods. During the late 1870’s they moved to East 19th Street. Here they were first listed at 15 East 19th Street in 1880/81 and by 1886 were listed at 3 East 19th Street where they remained until 1901. 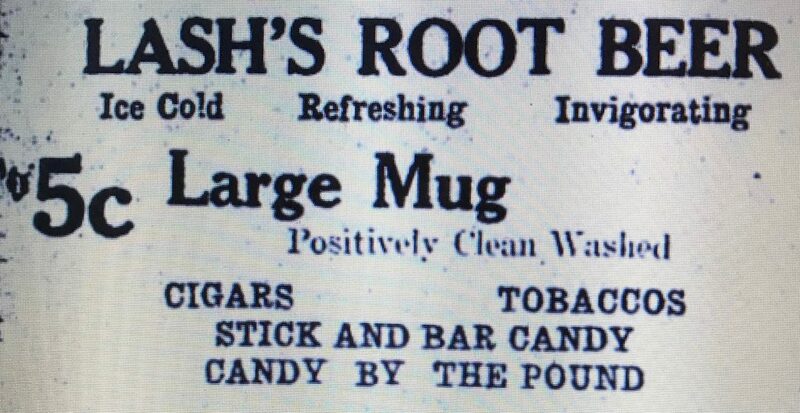 Between the mid 1880’s and early 1900’s the business also maintained a 125th Street location. 52, 59,61 and 108 W 125th Street were all listed during this period. This firm also known as the American Homoeopathic Pharmacy is one of the oldest houses engaged in preparing alcoholic tinctures of green plants and other supplies used by the Homoeopathic School of Medicine. They are the proprietors of a number of special preparations well known to the general drug trade as “Hurlburts” which have secured a large sale through their own merits, curative qualities and the established reputation and long experience of the manufacturers. These medicines are the result of scientific skill and medical knowledge. One of the oldest and most celebrated is their remedy for Croup coughs and Bronchial troubles, called Hurlburt’s Trachial Drops, prepared both in syrup and tablets – a remedy unqualified for the household in providing safety against that dread of mothers – the croup. Hurlburt’s Rubini Camphor Pills for Colds, Grippe and Dirreha were originated by this firm as the most convenient and desirable way of taking an efficient yet pleasant dose of camphor. They have many imitators, but to secure the genuine buyers should see that the label bears the trademark of the firm. Circulars and prices of these and other valuable remedies can be obtained by addressing Messrs Hurlburt and Co. who offer the trade very advantageous terms. 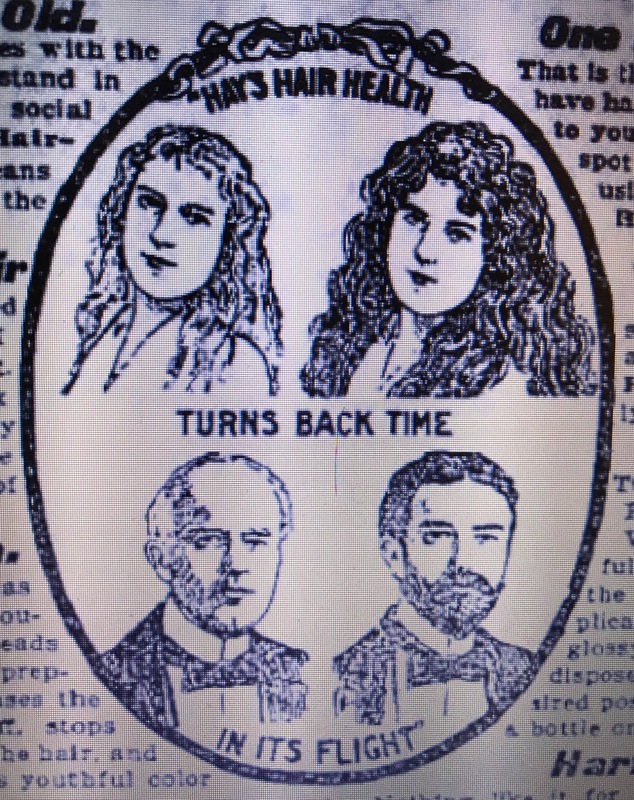 An advertisement printed in the October 2, 1892 issue of the New York Sun referenced the Tracheal Drops and Rubini Camphor Pills as well as several other products. In 1902 the business was listed at 575 Madison Avenue and by 1906 they were at 7 Barclay, where they stayed until 1911. 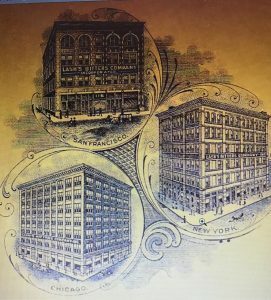 In 1912 they were first listed as a NY Corporation with Charles F Hurlburt as President, and an address of 45 Lafayette. 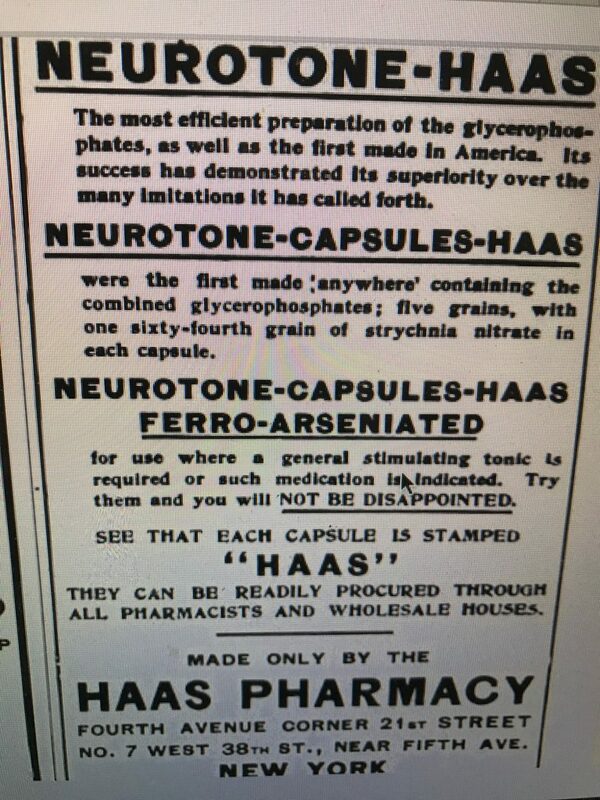 They were listed again in1913/14 but in 1915 Hurlburt’s Pharmacal Co was listed with Theo Stemmler as President. I’m not sure whether this is a continuation of the original company or not. C T Hurlburt & Co of New York City issued a new price list reducing the trade prices of their goods to the rates which prevailed before the war tax was imposed (I assume the was a tax associated with the Spanish American War that occurred in 1898). The 7 Barclay Street address is located in the current footprint of the Woolworth Building. The site for the building was acquired in 1911 and the building was built and opened by 1913. Hurlburt’s move to Lafayette Street in 1911 was certainly necessitated by the acquisition process for the new skyscraper. 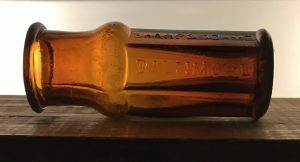 The bottle I found is a small (1-2 ounce), square medicine bottle with a tooled finish (maybe Hurlburt’s Trachial Drops??). 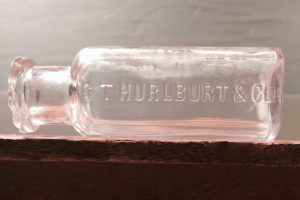 It’s embossed: C T Hurlburt & Co., so it was made after the partnership with Charles was formed in 1893. 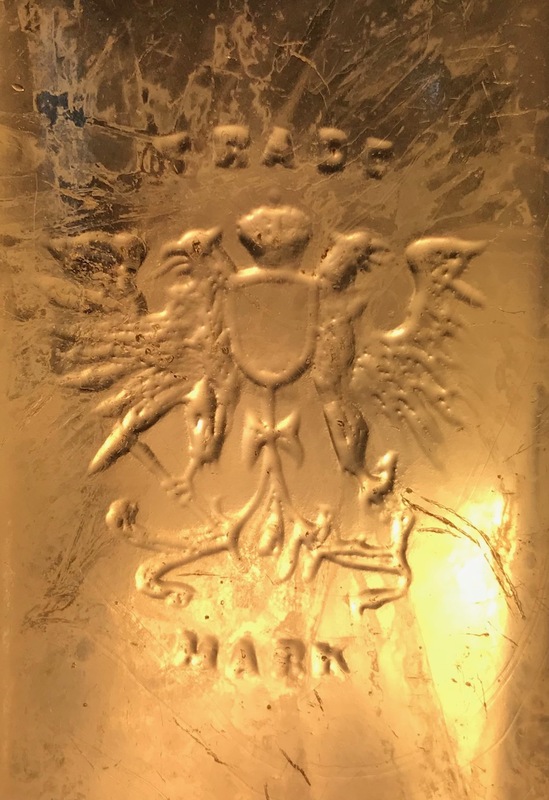 The maker’s mark TCW & Co is embossed on the base of the bottle indicating it was made by the T C Wheaton Glass Co. According to various Internet web sites, this specific mark was used between 1888 and 1901. 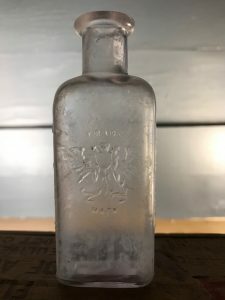 This dates the bottle between 1893 and 1901 and ties it to the E 19th Street location. The J stands for John S Seabury. 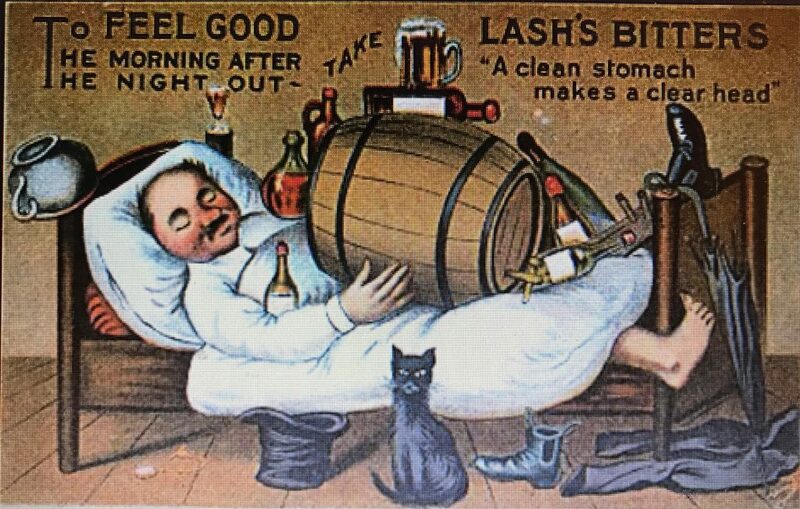 Born in 1811, he was a druggist and patent medicine proprietor from the 1830’s to at least 1882. He died in 1888. 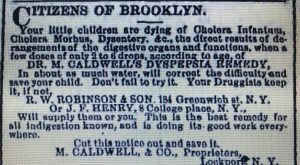 His obituary, printed in the November 1, 1888 issue of the ‘Pharmaceutical Record” states” John S Seabury, a well known druggist of Jamaica, New York and also in former years of this City, (NY) died at his home a few days ago. 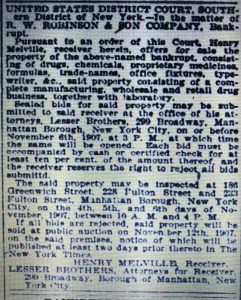 He began in business at New Rochelle, was later at Jamaica, and at one time was a member of the firm of Pinchot, Bruen & Seabury of this City (located on Fulton Street). 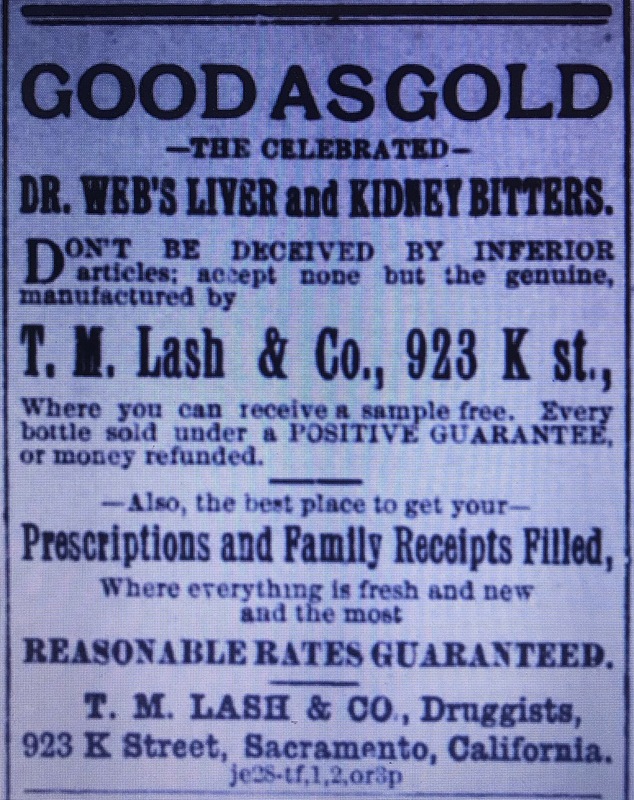 He had an excellent reputation as a druggist and a citizen. He was 77 years of age. It’s not clear when Seabury moved from New Rochelle to Jamaica, but J. S. Seabury & Co. of Jamaica was listed as an authorized agent for “Brandreth’s Pills” in the August 20, 1839 issue of the Long Island Star so he was doing business in Jamaica by then. For removing grease spots, paint, etc. from woolen cloths. 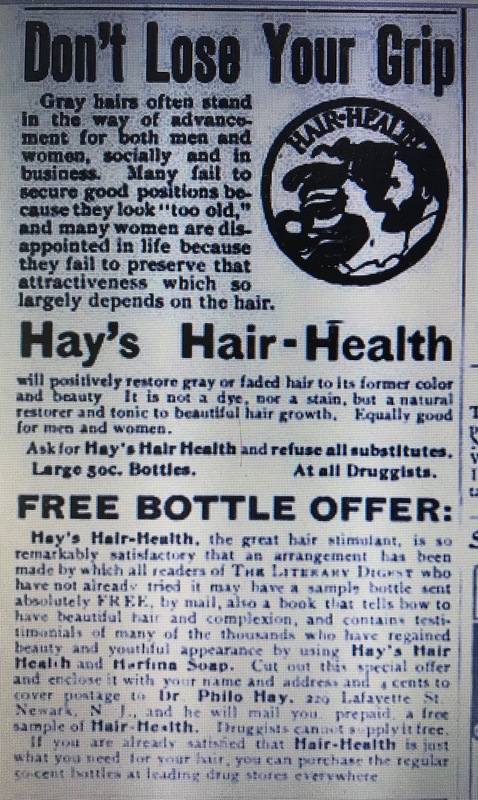 This is a new article lately invented by Mr. John S Seabury, Druggist, New Rochelle. The proprietor contents himself with merely stating in the label upon each bottle, the purpose of which it is intended, and the method of application; leaving those who choose to give it a trial to judge of its merits. We can say that we have never seen anything half so well adapted to removing spots from woolen garments as the Vestamental Soap. Price 25 cents a bottle. For sale at the New Drug and Book Store, by C. S. Watrous. an effectual and speedy remedy for rheumatism, cramps, sprains, bruises, wounds, stiff joints, sore throat, pains in the chest, side back, etc. prepared for many years by the late John Hawkshurst of Newtown Long Island. The subscriber having procured the original recipe for preparing this embrocation, the genuine article will in future bear his written signature on the directions accompanying each bottle…Certificates of the most respectable character to the efficiency of the above medicine might be procured but the subscriber deems it unnecessary, as he authorizes every vendor of the article to refund the money for any part of a bottle of the embrocation which may be returned, should it not prove as represented. 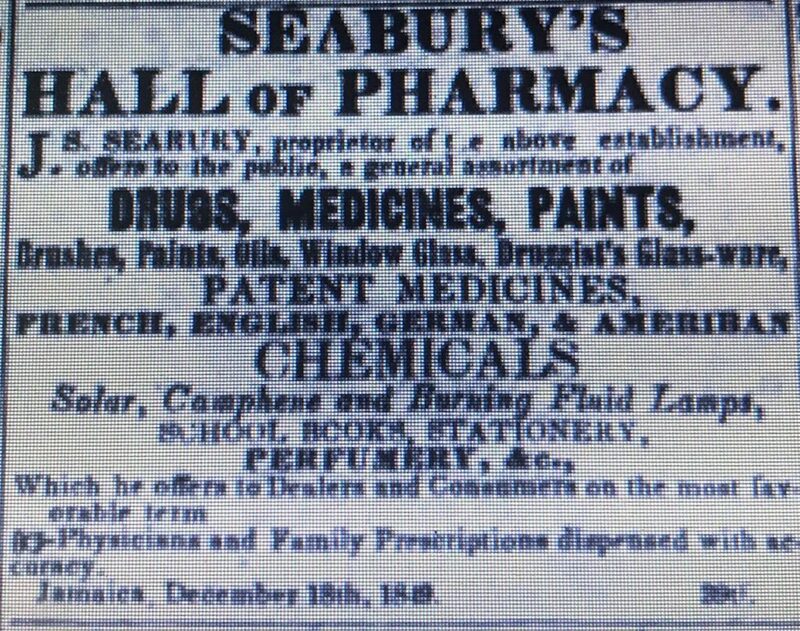 By 1849 he owned a drug store in Jamaica called “Seabury’s Hall of Pharmacy”. 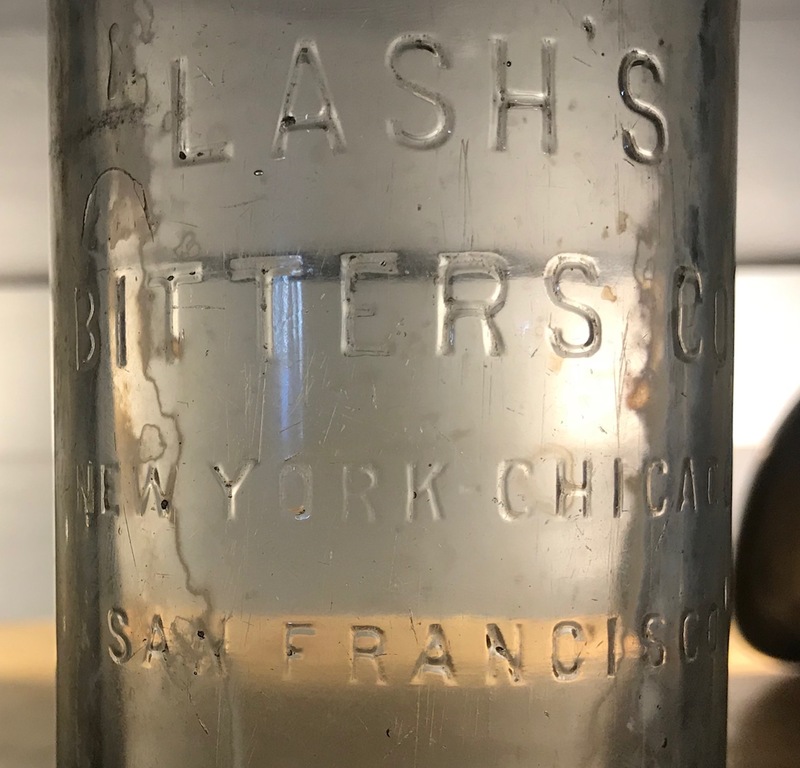 According to an advertisement in the L I Farmer in the early 1850’s it was advertised as a general store as much as a pharmacy, selling an assortment of products such as paints, books, stationary, window glass and lamps in addition to drugs and medicines. Seabury apparently continued in business on Long Island at other Jamaica locations until at least 1882. 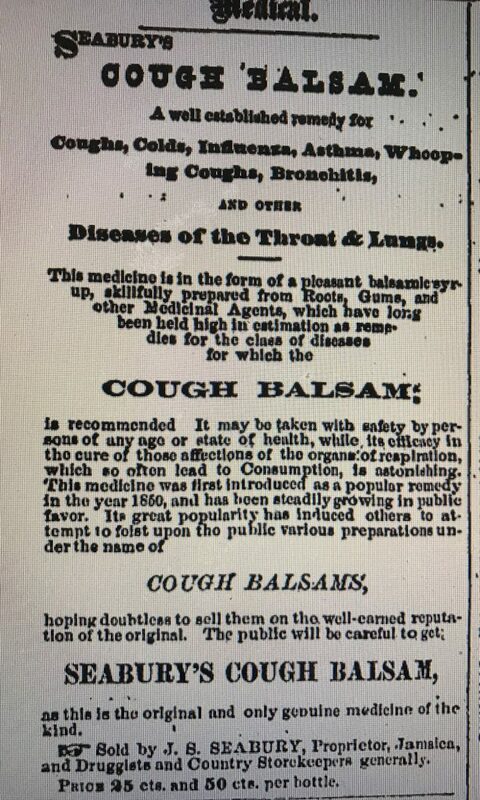 He was listed in Curtain’s Long Island Directory of 1868-1869 under patent medicines in Jamaica on Fulton St near Washington Ave and there’s an advertisement for Seabury’s Cough Balsam in an 1871 issue of the Long Island Farmer. The advertisement names Seabury as the sole proprietor in Jamaica. Desirous of retiring from active business, I offer for sale a first class drug store in the Village of Jamaica L I, also a well established fire insurance agency representing some of the best companies in the State. 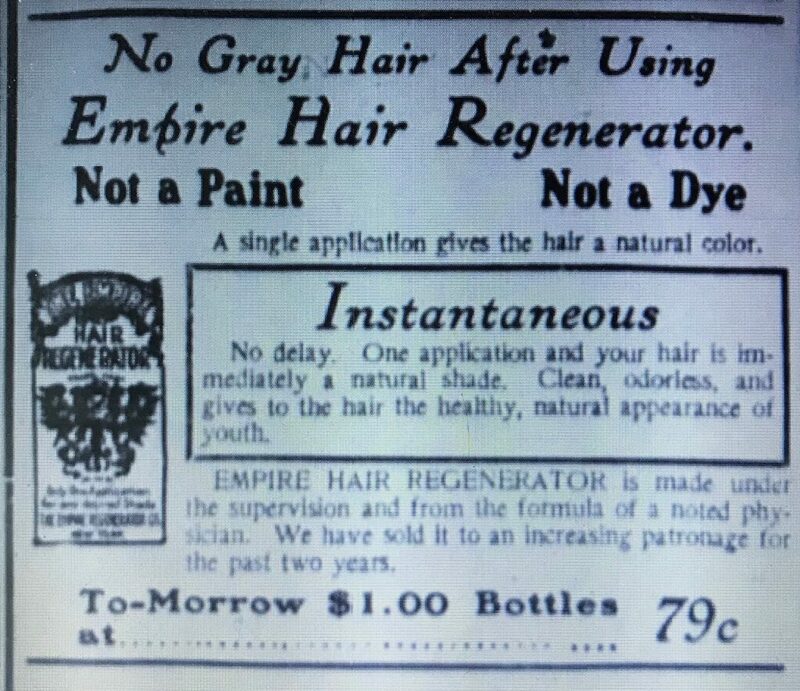 I would also sell one or all of my popular proprietary medicines. The above would be sold together or separately as desired. Address for particulars J S Seabury, Jamaica L I.
It’s not clear if and when he sold out. 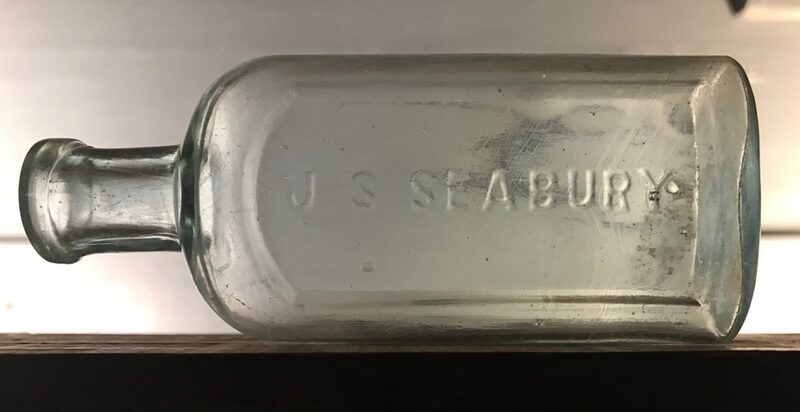 The bottle I found is a small (approximately 2 oz) medicine with an applied finish and only the Seabury name embossed on it. 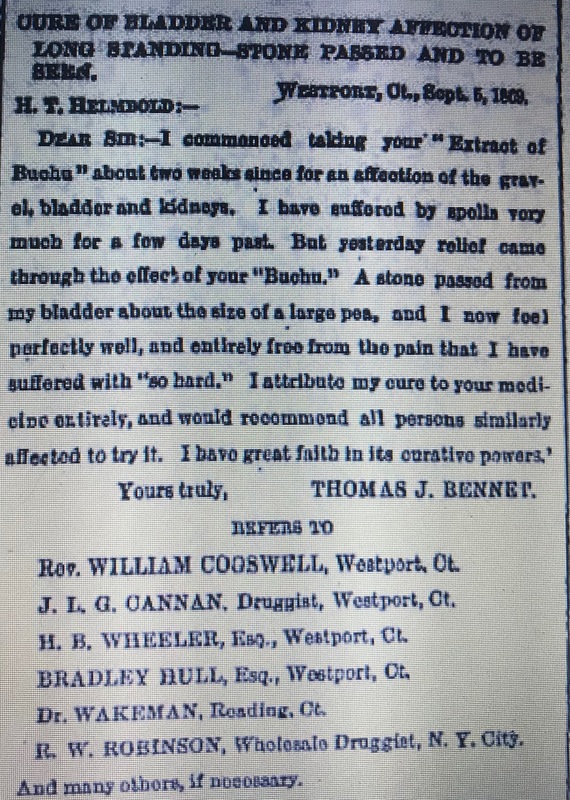 It probably contained a proprietary medicine (maybe cough balsam?) from the Fulton St location.